Inga alley cropping is a sustainable alternative method of farming in tropical rainforest/former rainforest areas that could replace slash and burn farming. It would benefit both the farmers, who typically are very poor, and remove the need for them to destroy more rainforest, because it maintains soil fertility and re-fertilizes previously degraded, useless land. The diagram below demonstrates clearly how effective it is. Growing maize with and without the help of Inga in two small plots in Cameroon. Reproduced with permission from the Rainforest Saver Foundation, www.rainforestsaver.org. To appreciate the problem that slash and burn farming is in Honduras, take a look at the photos below. Inga alley cropping consists of growing crops between rows of Inga trees. 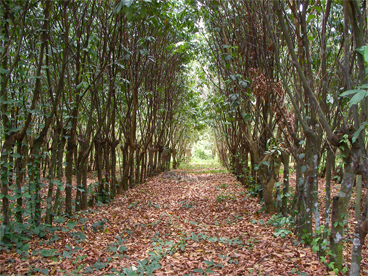 Inga (guama) trees, usually Inga edulis or oerstediana, are planted at 50 cm spacing between them within the rows, and with four meter spaces, the alleys, between the rows. The crops are cultivated in these alleys. The cycle begins with growing the Inga trees until their canopies close over the alleys and lack of light kills the weeds in the alleys. Then the farmer prunes the Inga trees to about chest height. He leaves the leaves and small branches in the alleys and uses the bigger branches as fuel for cooking. Once the small stuff has rotted down into a good mulch (usually in about six weeks) he plants crops into this. The Inga leaf litter decomposes slowly and protects against erosion because it absorbs the impact of raindrops. The trees themselves, and branches that are laid across them, further prevent erosion. Inga branches laid across the pruned Inga to prevent erosion. Photo FUPNAPIB 2006. The leaves on the ground are processed by fungi and bacteria under high temperature and humidity, like they would be in a natural forest, to become a rich mulch. This provides many nutrients to the soil, which allows for high and sustainable crop yields, without the use of fertilizers, herbicides or pesticides. The produce grown can therefore be labeled as organic. The Inga leaves secret a sweet substance that attracts wasps, ants and spiders, which eat many of the crops’ pests. The long pods contain fleshy green seeds in a sweet, white, cottony pulp. This pulp is edible. Hence the tree is often called the ice cream bean. Monkeys, birds and cattle also eat it. This can be a problem when one is growing seeds for planting and the monkeys have found the seed orchard. The production of corn, beans, pineapples and black pepper in the Inga alleys has been evaluated at CURLA (part of the National University of Honduras). Corn yields of up to 2 ton/ha have been obtained, and beans yields of 1.4 ton/ha. Such corn and bean yields are good, considering that one family of 8 consumes 1.4 ton of corn and 0.4 ton of beans yearly. Surpluses could be sold. Pineapples have also given good yields and quality comparable to those grown commercially by Standard Fruit of Honduras (Dole Corporation), but without the application of chemicals. Fuel wood production from the pruning has reached 6,580 sticks, or 65 loads. This exceeds family requirements and again the surplus can be sold. 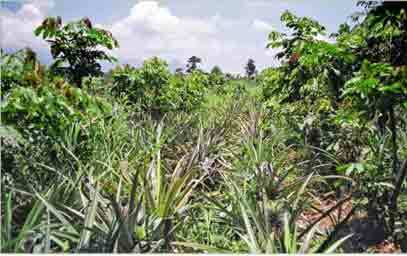 Its is estimated that one farmer can handle the farming of at least 2 hectares of the Inga system. FunaVid and CURLA believe the Inga system will be a great tool in helping to break the poverty cycle by making the land more fertile. It will help to protect the remaining forest as the farmer can keep on cultivating the same plot year after year without needing to clear new patches of forest to get fertile land. It will reduce erosion on steep slopes, which in turn will protect the reef system from non-point sources of sediment. This in turn will help fishing and tourism. It will remove the need to clear any more forest. Currently, there are six sites planted with Inga on FunaVid land and crops such as corn and beans are being grown. Information on the performance of the system is being collected and analyzed. High school students and teachers are being trained both at the schools and at FunaVid, where good facilities exist. FunaVid are setting up a large Inga alley demonstration plot high up on the mountain. Planting Inga is under way. The watershed at the top of the mountain has been acquired so that it will be possible to show how planting the area with Inga and reforestation will stabilize the soil, greatly reduce the sediment carried by the mountain streams, and thus reduce the sedimentation on the coral reef. Planting Inga alleys on the mountain. Photo Dr. M. Dodson 2013.